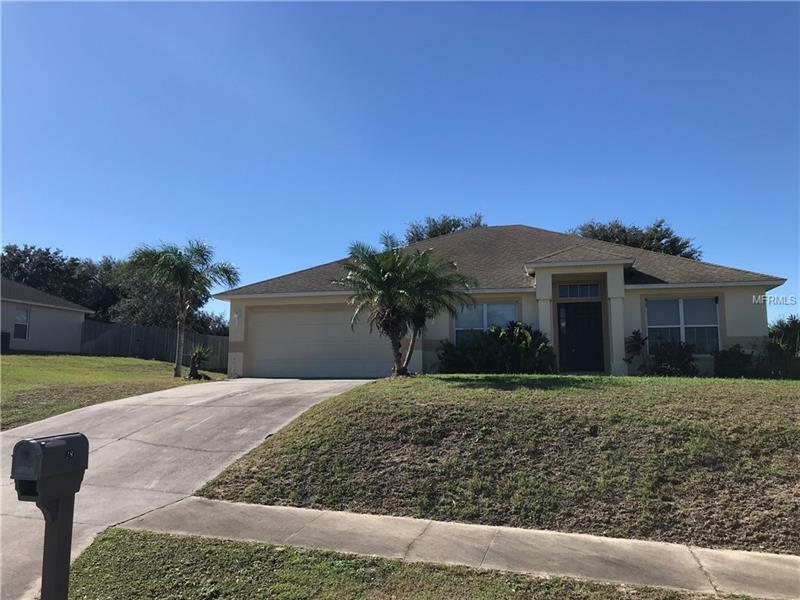 This is a wonderful family home in the quiet, family friendly community of Oak Valley, ideally located close to major roads, the Florida turnpike and downtown Clermont. The house has been freshly painted throughout. As you enter through the double doors at the front, there is spacious formal dining room on your left and a formal living room to your right. Walk through to the large open plan kitchen and family room, where you'll appreciate the sense of space and the cathedral ceiling. The large kitchen has plenty of storage and stainless steel appliances. The bedrooms are split plan: a spacious master bedroom with walk in closet and master bath with double vanity, garden tub and separate shower. On the other side of the house are bedrooms two and three, and the second bathroom with bath / shower combo. The laundry room is equipped with washer and dryer. Now open the French doors in the family room and take a look at the HUGE back yard. This is paradise for your family, with mature trees, so much space and no rear neighbors! This is a gem of a house for your family, so come take a look and submit your offer fast! Pet Restrictions: Please verify with HOA for all data on pet restrictions.